Pseudo-Isidore on Wikipedia. Please consider editing this article to keep it current and accurate. An edition-in-progress of the False Capitularies, by Gerhard Schmitz, Veronika Lukas and others, includes many resources relevant for the problem of the False Decretals, including a full and searchable transcript of the interpolated Hispana by Annette Grabowsky. In every way the antecedent to my efforts here is the old edition-in-progress of the False Decretals, now discontinued, by Karl-Georg Schon. Please note that the text provided by Schon is not an edition, but a raw collation of some of the oldest and most important manuscript sources. Searchable ancient and medieval Latin textual corpora, including the Patrologia Latina are available at Corpus Corporum repositorium operum Latinorum apud universitatem Turicensem. The digital Monumenta Germaniae Historica provides convenient and easily linkable online access to all editions save for those published in the last three years. Philippe Depreux, Stefan Esders, Michael Glatthaar, Steffen Patzold and Karl Ubl are editing the (authentic) Carolingian capitularies, and their ever-expanding website contains many helpful materials. See also the Bibliotheca Legum, a database of Carolingian-era secular legal texts, also headed by Karl Ubl. The Carolingian Canon Law Project, directed by Prof. Abigail Firey at the University of Kentucky, assembles transcripts of manuscripts relevant for the canon law of the Carolingian era. 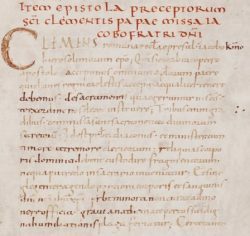 The Medieval Canon Law Virtual Library, managed by David M. Freidenreich, provides resources with a special focus on the high medieval period. Editorial projects relating to high medieval canon law also have an internet presence. See in particular the effort to edit the first recension of Gratian’s Decretum lead by Anders Winroth. Martin Brett, Bruce Brasington, Christoff Rolker and Przemysław Nowak are editing the canonical collections traditionally associated with Ivo of Chartres. Finally, my old blog. Older posts in particular reflect my first encounters with the False Decretals and contain the inevitable errors of approach and misunderstandings. Major research on canon law is supported and organized by professional societies. These include the Stephan Kuttner Institute of Medieval Canon Law and the International Society of Medieval Canon Law. If something should be added to this list, please let me know.